GURPS Wild Cards: Aces Abroad is your guide to the world of the wild card outside of New York. In this action-packed adventure, players take on the roles of government agents striving to defuse a plot to cause worldwide outbreaks of the wild card – instigated by the international joker-terrorist group, the Twisted Fists. Or players can be the terrorists themselves – intent on subverting the mission and achieving worldwide equality! 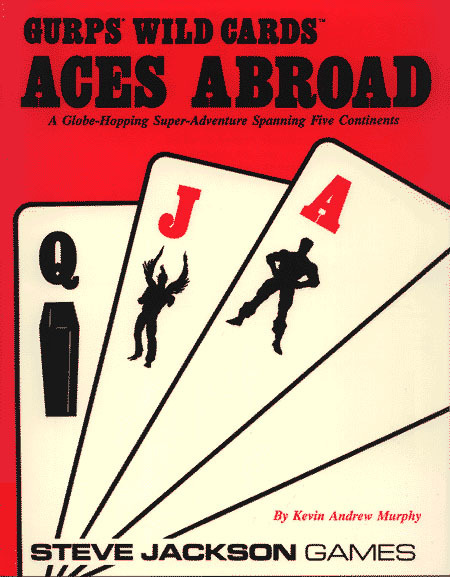 Agents and terrorists travel the globe, discovering more each mission while they explore the exotic and dangerous world of Aces Abroad. Also included are two new powers to use with GURPS Supers and Psionics and a dozen new creatures to populate the mysterious Australian Dreamtime. The agents will visit . . . The Highlands of Peru, where they face the perils of Incan blood rituals, guerilla warfare and international drug lords. The Parliament of South Africa, where African magic and the wild card mix with the politics and policies of apartheid. Tumultuous Northern Ireland, where warring factions battle with petrol bombs, Armalites and the wild card, and the creatures of Celtic myth run wild through the night. The markets of Bali, where the ancient battle between the evil Rangda and the heroic Barong is fought anew, and where the shadows of the wayang theater can spring to life. The Australian outback, where supers and jokers fight the forces of evil in the Dreamtime of aboriginal legend. GURPS Wild Cards – A complete, detailed guide to the Wild Cards series. Now you can enter that world, with "ace" powers of your own.